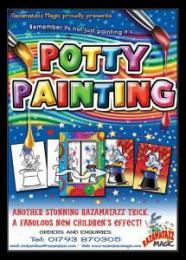 New Rudolph and Christmas tree design card set to use with Potty Painting, Ideal for any Christmas shows or parties ! Messy Rudolph card with splodges and scribbles. 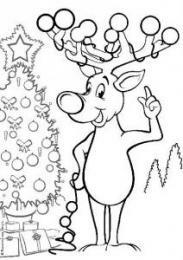 A blank plain card turns it into a black and white line drawing of Rudolph reindeer after the children pretend to draw a picture in the air. The children will not be happy with this so the picture is coloured in by getting tall the children to throw the colours at the picture. The Magician pretends some of the colours hit them in the face as the children giggle !!! On taking the Rudolph picture out, it is seen to be all messed up and scribbled on and looks an awful mess ! Eventually the children paint Rudoplh in the air and magically change the messy picture into a beautiful full colour, glossy picture to give out to a lucky helper at the end of the trick. 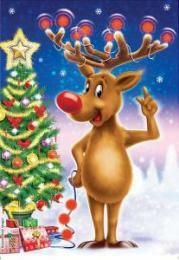 Packs of the Rudolph with Christmas tree design card giveaway refills are available separately.